Hirtenberger has been known for its quality of manufacture and consistency in precision for decades. This surplus .308 ammunition is no exception. With a clean, non-corrosive firing experience, it cycles smoothly through your rifle with no issues. Time and time again customers find this product is top quality and well worth the price at $0.55 cents per round in this 960-round offering. This 146 grain Full Metal Jacket (FMJ) round is fired at 2,741 fps with consistent accuracy at mid-to-long range. The bullet is magnetic due to the steel in the FMJ. The muzzle energy produced is 2,428 ft-lbs. Manufactured to the specifications of the .308 Win ammunition, it can be used in compatible firearms. The casings are non-corrosive Berdan-primed brass and are regarded as some of the toughest and cleanest casings on the market. Produced in Austria, Hirtenberger ammunition is made to exacting standards and will not fail in uniformity. We are proud to offer this effective ammunition at such a reasonable price to our customers. Enjoy your Hirtenberger .308 as we know you will! Not worth the trouble IMHO very disatisfied with this. 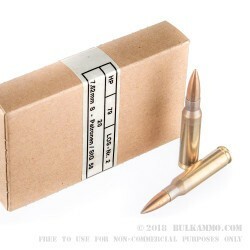 I gave this ammo 5 stars because it works well and its cheaper than competitor ammo "BUT" if you plan on reloading this ammo forget it!!. instead of a single flash hole in the center it has 2 "small" flash holes on the sides of the primer pocket, you cant decap these rounds. so shoot it n leave it on the ground at the range. Well satisfied in all ways. Will buy again. Shoot 500 rds through a Rem700, with and without silencer. Great Product - Even better price! 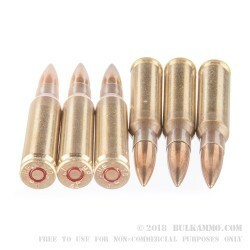 I used Hirtenbeger .308 ammo extensively in the 90's when it and British RadGreen dominated the surplus market It is clean, very accurate and I never had a FTF when using it. two business days later; great service. Pricing and shipping from Bulkammo was less than other on-line competitors and believe me I did a lot of research before ordering. 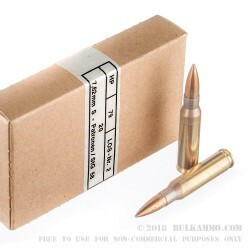 The ammo I received was head stamped 08, clean and professionally packaged. Q: Is this steel core ammo? A: Hi Tyler, This ammunition has a berdan-primed brass casing and lead core bullet, but is magnetic as the jacket contains steel. A: Hello Tony, This ammunition is loaded in berdan primed brass casings. A: Hi Scott, These are not typically considered reloadable as they use berdan primers. Berdan primers are difficult and require special tools to be able to reload. A: Hello Mike! While the Hirtenberger ammunition is a surplus round, it is loaded with all non-corrosive components. 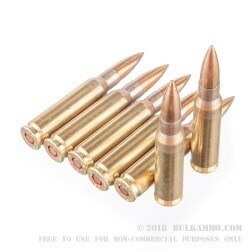 This ammunition is one of the highest quality surplus rounds on the market currently. Q: Is there any steel in this ammo? Will it pass the magnet test? A: Hello William! This ammunition does contain steel in the bullet and will not pass any magnet tests. Q: When was this ammo manufactured? A: Hello Mitchell, The Hirtenberger ammunition was manufactured in the 1970s.